...life, the ministry, and the experience of Jesus Christ, the example that He set, and finding out why it is, that He taught exactly contrary to what the churches teach today. They call themselves Christian. They say they're preaching the gospel of Jesus Christ. But they do preach a gospel about Christ, about His person, they exalt Christ, but they do not preach the things that He proclaimed, and that He taught. And they do not follow the customs of which He set them an example. Why? Now, we've found that Jesus went everywhere preaching the gospel of the Kingdom of God. Not very many people today know what the Kingdom of God is. Some people use the word 'Kingdom of God', some people use the word 'Kingdom', but they aren't preaching the Kingdom that Jesus preached. He was preaching a Kingdom that was not of this world. And they preach something that's altogether of this world today. Well, you will remember then, that messengers came and told this man that his daughter was dead and why trouble Christ? He delayed getting there, and they said the daughter was dead. Jesus said she is not dead, she's only sleeping. But when He came to the house, they were wailing and they were crying. Jesus rebuked them for it, and then they sneered and jeered at Him. And He put them out, because He couldn't have unbelievers in the room while He healed the sick. How different that example is from the kind of healing meetings we have today. 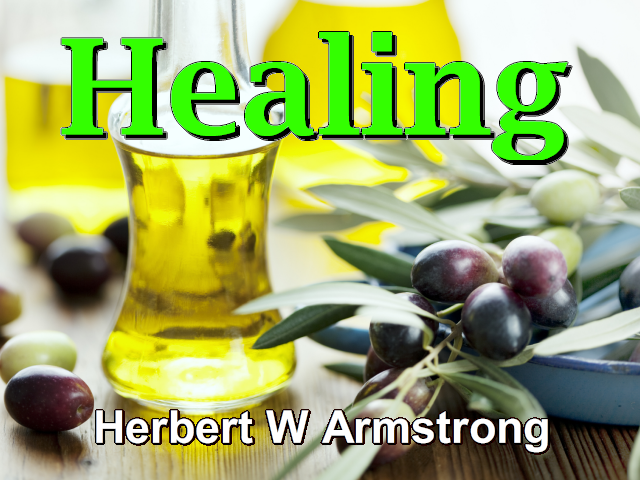 Now, most churches today don't believe in healing at all. They say that's all past and yet God has healed the sick ever since He's had people on this earth. God healed people way back in ancient Israel in the days of Moses and He had continually healed them back in the days of Moses. Now, I could take the time, but I'm not going to take it now, to go through the passages of the Old Testament in Kings and Chronicles, and show you how God did heal the kings and the people in Israel all down through that time. And one king that did not turn to God, did not rely on God but relied on the human physicians, died. Because, as God said, it is because you haven't got a God in Israel. Well, he went to the god of medicine that was over in an adjoining nation. But the way they did. They believed that their god would heal people through human means. They believed that their god had raised up medical science and would heal through the doctors, their drugs and medicines. And God said that was idolatry. And this king had to die because of his sin in trusting in that sort of thing. Now, believe it or not, my friends, that's in your Bible. And that God heals diseases just as much as He forgives our sins. Well, Jesus paid the price of forgiving our sins by giving His blood, His life, and the blood is life. And He shed His blood, and the blood of Christ, well, it paid the penalty for your sins and mine. Therefore we can be released from paying the penalty. So He said, and He was only quoting from the prophet Isaiah. And Isaiah was inspired to write that. And the New Testament Church is founded on the very foundation of the prophets as well as the apostles, and Jesus Christ Himself the chief cornerstone. Now, Isaiah is one of those prophets and the New Testament Church is founded on the apostles. You know, I heard a minister saying, I don't know whether it was on a Coast-to-Coast broadcast or not, it may have been a local station, I don't know, I just happen to catch a part of it apparently. And I heard a minister saying, however, on that program that if you wanted...about the Old and the New Testament. He was explaining the Bible, and that it's divided into the two parts and one we called the Old Testament and the other the New, and he explained that the word Testament means Covenant. And he said, 'Now, if you want to know the way of salvation, you wouldn't look in the Old Testament, you'd never find it there.' You know, I'm astonished, my friends, that people like that can come out and call themselves the ministers of Jesus Christ in such colossal ignorance! Now, what Holy Scriptures had Timothy known from a child? The only scriptures that had been written at the time Timothy was a child, were the Old Testament. The New Testament wasn't gathered together as scripture for some time later. They were letters that Paul wrote, and the epistles of, well of, the Gospels of Matthew, Mark, Luke and John, and the letters of John and James, and of Peter and so on. And part of it, the Book of Revelation, for instance and most of John's writings were not written until along in the nineties AD. And this was written a long time before that, and he's talking about the scriptures that Timothy had known from a child. Now, that was the Old Testament. And it's about time we realize that the whole Bible is the whole Word of God and the Old Testament just the same as the New. My friends, you can't even find what you're going to inherit through Christ. And what the promises of salvation to the Christian are, unless you can turn back beginning at the twelfth chapter of Genesis and find what God promised to Abraham. Yes, they certainly have lost the gospel of Jesus Christ and we're living in an age of confusion. And let me tell you, my friends, don't believe everything you hear. I'm just too busy to listen to everyone who's preaching on the air, and sometimes I don't realize how many there are, that are preaching. They aren't preaching the gospel, all of them, but they claim to, and they're preaching on the air. Now listen, sometimes you have no way of knowing who is right and who is wrong. But I'll tell you how to find out. Do like the Bereans did when the apostle Paul came along. They'd heard a lot of false preachers then too, because they had a lot of them then. I don't believe as many as we have today, but they had a lot of them. And Paul came along, they didn't know whether he was one who had the truth. And so far as that's concerned, a lot of you, if you hadn't listened a long time, and followed this example that I'm going to show you, perhaps won't know whether I'm one of the true ones, or one of the false ones. And there're plenty of the false. And I'll tell you they're about 999 false to everyone that's true, if you can only believe it. And if you'll read the Bible you'll find that's what's prophesied. That's pretty hard to believe. That was the struggle I had in the beginning. I couldn't believe that all of these religious people could be wrong. And I had to find how wrong humanity can be. And how far we have strayed from God, and how far we've strayed from the Bible. That was a pretty bitter pill for me. It was a very hard lesson for me to learn and I finally learned it. If I speak to you exactly what your Bible says in plain language without twisting it, without distorting it, without wresting it, without trying to interpret it, then you can believe it, because it's exactly what the Bible says. In other words, my friends, here's what I'm trying to tell you. Don't believe me, don't believe any other preacher, believe God. But listen to the preachers, and then search the scriptures and see whether they're leading you in the right place or not. Now, you're going to get salvation, if you get it, through the Word of God. And you have to be born again, through and by the Word of God. I wonder if you realize that. That's what God has given us. God has said, or Jesus said we must live by every word of God (Matthew 4:4, Luke 4:4).It's something for you to live by. How can you do it if you don't know what it says? How can you do it if you don't understand it, if you don't ever study it? I'll tell you the trouble with us today. It's why we have so much sickness and disease, why we have so many fears and worries, why our lives are so empty and why we're so worried and everything else. We're too far from God and we're far from God because we don't spend enough time in prayer, and we don't spend enough time studying the Bible. We're just willing to believe anything that comes along. And I want to tell you, my friends, plenty of things are coming along. And I couldn't be honest if I tried to tell you, 'Now, just follow me.' that, 'I'm the only one that's right and everybody else is wrong.' I say you read your Bible, you be the judge of who's right. But I want to tell there aren't very many of them that are right. Most churches don't even believe in healing today. And the few that do, it seems, that a good many of them put on a public show about it. And they invite everybody to come in, and with unbelievers as well as believers. And how do they know what a mixture they have, or who's a believer and who isn't? And then they claim to pray for, and anoint the sick right there in a parade, and in a show in front of everybody. My friends, Jesus Christ didn't do it that way. Jesus Christ put the unbelievers out of the room before He prayed. He had the people of faith there because a lack of faith will destroy it every time. And if even the Savior Himself, Jesus Christ, couldn't heal the sick, until He put the unbelievers out. And if He couldn't heal those that did not believe, and I'm going to show you that He couldn't, then how can men today do any better? It's about time we began to learn just exactly what the Bible says about this thing. Now, here in verse forty, Mark the fifth chapter in verse forty, Jesus having put them all forth, these people that were wailing and weeping so. And that had laughed Him to scorn, when He told them not to do it. And that the woman was only sleeping and not dead -or the girl rather. He, having put them all forth, He took the father of the child and her mother and those that were with Him. And before it had explained that was just some of His own disciples that certainly believed, and He went in where the child was. He took her by the hand and had her rise, and she was well and healed. "I know that you can heal me, if you will [he wanted to know His will, Jesus told him His will. He said]...I will ; be thou healed." (Mark 1:40-41 paraphrased) We passed that some days back in this program. Now, He came to His own country, and His own city even in Nazareth. Where He had been brought up. Now, He's coming to His own hometown, where He had been brought up and people had seen Him grow up from a little boy. In other words, 'Why, we've seen him out here as a carpenter, building houses.' And I want you to notice along the way that while Jesus grew up, and before He entered His ministry, He was earning His living. He didn't idle away His time. He didn't live in ease and luxury and in idleness. Now, He did have some good things. He wasn't altogether poor. He was poor in one way, but He did have good things. Some of them were given to Him, but He had them. But, nevertheless, when He worked, my friends, He worked at something that was constructive, He builded, He was a carpenter. I wonder if you can realize that God is Creator and creating is building, making, constructing, creating. Now, of course, there's a difference actually, and technically, between making and creating. Creating is really bringing into existence, and from nothing. No man can do that. But God has given us, in a sense, some creative powers in that we can at least plan, and design, and construct, and make. But did you ever notice that human beings get a lot more joy, somehow or other, out of tearing down than they do out of building up? Now, God is Creator and He set us here to become like Him. We are to enter into the family of God, if we are ever really converted. We're to leave the human family, the animal kingdom and get into, and be born into the God Kingdom. Very few people seem to realize that or know why we were put here on the earth. Well, if you have an ear to hear, my friends, you'd better hear because you haven't heard these truths very much in this day and age. They haven't been heard very much since the days of the apostles. Why these truths have been buried I don't altogether understand, except it is the way of humanity, and God has let humanity have its own way. He's given humanity a lot of rope. And humanity is just about to commit suicide if God were not going to step in, in the very near future and intervene. You know, my friends, I used to hear an expression, years ago, 'Far away pastures look greener.' I wonder if you ever heard that? The far away pastures look greener. The pasture right at hand never seems to be very good. You know, I knew of a man one time, he was so miserable, and so unhappy he just said, "If I could be in some other place I would be happy." And first, he would want to go one town, or one city, or one state. And if he could only be there and live there, he would be happy. When he got there it was the most miserable old rotten old hellhole on earth. That was the expression he used. And he was so unhappy. Now, he wanted to go some other place. He'd go there and he was still just as miserable as ever. And now it was the most terrible place on earth. He had been in Iowa. He wanted to go to Idaho. When he got there, it was a, oh, it was a terrible place. He got back to Iowa. Then he wanted to go back to Illinois. And he got to Illinois and it was worse yet. He was never happy wherever he was. He never could see that that unhappiness was inside of himself and not in a geographical location. So far away pastures always look greener and look more pleasant. And why is it, my friends, that a prophet looks like he is — he looks like a real prophet to people if he comes from way off? If a man is a famous scientist, and he comes over here from some foreign land way, way off someplace, and he's supposed to be a doctor or a scientist. Oh, you think he must be a great man. But if he's in your own town you think he couldn't amount to anything. Well, sometimes the greatest are right there near at hand, and the biggest opportunities are right at hand, if you could only see them. Well, they thought Jesus couldn't amount to anything. Who could he be? He was a local lad. He was Jesus Christ the Savior, the Son of God, but He was not able to do any mighty works. He couldn't do these powerful things. He didn't have the power of God. Why? Even Jesus was unable in that kind of company. Now, I showed you a while ago He had to put the doubters and the unbelievers out of the room, before He either healed this woman, or raised her from the dead, take your choice. The people said she was dead, Jesus said she was only sleeping. Maybe it was both. And only a few were healed and many were not. I've told you my friends, thousands of people come to me, or write to me for healing. And when I can't go to so many because I haven't enough time for one man to go to so many people, it isn't possible, and my time is so filled. I have to do as the apostle Paul did as you find recorded in the nineteenth chapter of Acts, and pray over pieces of cloth, anoint and lay my hands on them and send those out to the people. Just as the apostle Paul did and God honors it. And by that method, a man born blind from birth received his sight. A number of people with cancer have been healed. A woman with a withered arm, her arm grew out normal and natural. And her doubting husband confessed it to two of our young men from our college here when they visited, the place back in the Middle West. Even though he was still, apparently, a scoffer and a doubter as I remembered, I'm not sure about that. But anyhow, incurable diseases and everything, and God has healed them because He is the same God today and He has the same power today that He did then. Obedience and faith, those are the twin conditions, surrender to obey God, and then believe Him and trust Him. Now, why couldn't He do very many works there? Why was it He could only heal just a few, even Christ Himself? Because of their unbelief. And, my friends, I know that there perhaps are a few hundred of you listening who have written in for anointed cloths, and I've sent them. And you have not been healed, and I hope that you're learning now why. Why don't you write in for our booklet on 'What Is Faith?' and learn why you have not had the faith. And perhaps you don't understand well enough, and to understand better, you better get our booklet on 'Healing.' I mentioned this in the preceding program. Now, a lot of you intended to write for it. You didn't do it then. Don't put it off again now. Do it now! Get that pen and that paper and write it down. Don't let another thing interfere and write it immediately, the booklet on 'What Is Faith? ', the booklet on 'Healing.' There's no charge. So, until tomorrow, goodbye friends.